For readers who are new to our “Camp of the Saints” series: the title refers to the apocalyptic refugee scenario described in Jean Raspail’s novel The Camp of the Saints. Since early April I’ve been referring to the migration wave from North Africa across the Mediterranean as “The Camp of the Saints”. The refugee crisis began in January as soon as the uprising in Tunisia got going in earnest, and intensified as the “Arab Spring” spread to other countries in the region. Since NATO began its air war on Libya, most of the new refugees have been fleeing the Libyan civil war. 18 Camp of the Saints: Stop the Trains! 11 Camp of the Saints: How Many Infidels? 28 Camp of the Saints: Another Lull? 3 Camp of the Saints: Vacation Time… Not! 16 Camp of the Saints: Whose Numbers? Thanks Baron, this really helps, and is likely a unique reportorial resource on this issue. I'm woefully ignorant: have all or most of these "refugees" been muslim, or have some of the Christians being persecuted in the Middle East made it out of their respective countries? 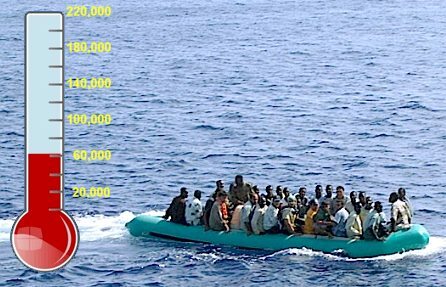 The Mediterranean Boat People: Black refugees from Arabic racism? Yeah but even a majority of the blacks are SOMALIAN, OR SUDANESE, Ethiopian, whatever and they ARE muslim too. I live in Sweden and am surrounded by Somalians, I just can't stand the sight of them.